Tristram Cary has been at the leading edge of technology and creativity for close to half a century. This year marks his 75th birthday and while Cary is, perhaps, most widely known for his film scores, his significant contribution to the innovation and expansion of electronic music is well marked by Soundings, a fine, two-CD retrospective from Tall Poppies. With assistance from ArtsSA, Cary and Tall Poppies have brought together 15 works that cover from 1955 to ’96. The elaborately annotated discs are retrospectively devoted to an intriguing group of “analogue” pieces and Cary’s later, ground-breaking work in computer music. The early analogue experiments, many made to accomany BBC radio plays in the ‘50s and ‘60s, generate complex sonic microcosms with what now seems like impossibly primitive technology. Curiously in the present techno-euphoria, these steam-driven creations still have a real freshness of sound and invention. The suites from Leviathan 99 and The Children of Lir are particularly impressive. The second disc presents a number of Cary’s most important abstract computer works: the Nonet, realised in California in 1979, and several compositions produced in the computer music studio that he established at Elder Conservatorium during the 1980s – all of them a testament to Cary’s unflagging creativity. The Impossible Piano – an exhilarating homage to Conlon Nancarrow – is an ideal finale to this collection which has a value well beyond its documentary/anniversary appearance. And what a pleasure re-encountering the older works is, and what a joy to hear works I hadn't known previously! 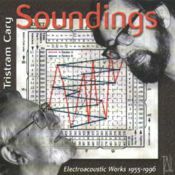 Let's be perfectly clear: The release of this two CD set of Tristram Cary's electroacoustic works is a major event for new music in Australia, and a significant event for international computer music. There are a number of works of historical technical significance here (such as the first all electronic soundtrack for a BBC play), but what is more important, these works, decades later, sound great. They are good music, and not just significant demonstrations of what the technology of the time could do. The two CDs are divided into works for analogue tape, from 1955-1978, and works for computer 1979-1996. Some of the analogue works from the 1950s have been processed and cleaned up with the computer, but as Cary says in his wonderfully comprehensive liner notes, he was careful not ot use any technique he did not have at the time of his composing the original work. One of the most attractive things for me about the CDs is how "commercial" works and "art" works are placed side by side. For example, after the purely abstract analogue complexity of "Continuum" (1969), we get the absolutely programmatic radio play soundtrack "Suite - Leviathan '99", and both works hold up extremely well, and are absorbing listening. In fact, if you didn't read the program note for "Suite - Leviathan '99", you wouldn't realize that the work had any but a purely musical origin. What would be noticed is that there is a more "instrumental" approach to making some of the sounds in "Leviathan" than "Continuum", but this comes across more as an aesthetic difference rather than as a result of any external constraints placed upon the composer by the circumstances of the works' origin. "Continuum" is a work for voltage controlled equipment, and has some very attractive sounds. At its thickest, about 40 layers of sound are operating, and they make a wonderfully dense cluster. The piece comes as if from a great distance, has three episodes of getting thicker and thinner, more or less dramatic, and then recedes away, as if we heard only three episodes from an infinite process of growth and decay. This sort of "glimpses of a few aspects of an infinite process" is a form that Cary will use again and again in his career. Somewhat similar cyclical forms, which imply that material heard is infinitely repeating, are also used extensively. "Suite - Leviathan '99" (1972) is not cyclical, but is a more thundery and dramatic piece. There are a number of sounds which appear and reappear throughout the work, such as the panpipe like melodies which indicate the character Quell. I found this piece a very enjoyable listen. "3 4 5 - A Study in Limited Resources" (1967) is one of my favourite electronic music pieces by any composer. Every time I hear it, I smile. In this piece, Cary takes an absolutely ridiculous premise - using only frequencies of 3, 4, 5, 30, 40, 50, 300, 400, 500, 3K, 4K, 5K and 30K, 40K and 50K cycles - and proceeds to make an absolutely serious and very fun piece using it. The subsonics are heard as rhythmic articulation, as well as pounding sounds on their own, the supersonics are used as modulation frequencies, producing a whole range of interesting textures. This is virtuoso composing at its best - using absolutely rigid restrictions to produce an engrossing piece that couldn't have existed any other way. If you ever encounter anyone who gives you all the old dreary arguments about how serialist thinking couldn't have produced good music because of how its premises violated psychoacoustic realities of human hearing blah blah quack quack, just play them this austere and beautiful piece and giggle. The original issue of this piece, by Galliard in 1970, as a 7 inch phonograph record, had a score included. The liner notes with the CD also include a page of the score, which while not as good as the whole thing, at least gives an insight into Cary's thought processes as he put this very entertaining piece together. "The Children of Lir" (1959) is the first all electronic soundtrack to a BBC radio play. It's a classic piece of musique concrete, where sped up and slowed down sounds abound, and dramatic climax is achieved through the use of slow tape speed change. It's interesting to hear these simplistic effects after many years. It's true, as effects they are simplistic, but they sound good! The combination of extreme simplicity and complexity in this piece - the fragment of electronically accompanied folk song is a good example - is an attractive one, and the piece is very effective. "Birth is Life is Power is Death is God is..." (1967) is, as the title implies, another of the cyclical pieces. It's a tape piece put together from soundtracks used for a multiscreen film shown at Expo 67, in Montreal. (Note to postgraduate students: there's a thesis topic in researching all the many electronic music installations commissioned for use at World Fairs and Expos!) Material from the nine 41/2 minute loops used for the film are reassembled into a 9 minute piece, which has dramatic powerful surges of sound alternating with textures that today, we would call "granular". The piece also showed me the importance of the reverb unit in music from this period as a tool of synthesis itself, and not just as an embellishing tool. That is, the timbral world of these pieces would be unthinkable without the long delays of sound afterglow produced by these early reverb units. The afterglows quickly become heard as essential sounds in themselves, and not just as residues of the sounds of their origin. "The Japanese Fishermen" (1955) is the oldest of the pieces here, and also one of the newest. The original materials for the BBC radio programme soundtrack (concerning Japanese fishermen killed by US atomic testing in the Pacific in the early 50s) existed on 78 RPM mono acetate disks. Cary transferred these into the computer in 1996, micro-editing out the acetate clicks, and then assembled them into the piece here. When assembling the piece, he was careful not to employ any techniques he did not have available at that ime. The resulting piece is dark and moody, with some absolutely beautiful sounds. Japanese noisecore fans will be interested in this piece, which is a clear precedent to the kinds of sound and organization that appeal to them. "Narcissus" (1968) for flute and two tape recorders is a classic. The two tape recorders have prepared blank tape on them, into which leader tape of specified lengths has been cut. During the performance, the electronics performer records, plays back, reverses the direction of the tape, and changes the speed of the tape recorders, following the instructions on the score, a page of which is also included in the liner notes. The flute part is in a mid-century "modernist" style, with wide leaps, fast ornaments, and great timbral variety. It's lovely. And when the tape playback starts, the nature of this "modernism", which is an updated response to impressionism, becomes clear. Another thing I realised in listening to this piece is how much the sound of analogue tape speed up itself is part of the timbral "corona" of the electronic music of this period. By the end of the piece, "Narcissus" is as lush and evocative a sound world as you could wish for. The first CD ends with "Steam Music" (1978). This is a collage of recordings of steam engine whistles. How fitting that Cary's work with tape music should end with a piece that uses the exact techniques - tape collage - that started off the genre. There are some luscious sound textures in this piece, but they require careful listening. The combining of the different recordings, made in different environments and at different distances, creates a quite surreal soundscape that I often found myself quite lost within. The second CD features works for computer from 1979 - 1996. There are no soundtrack works on this disk, but some of the works were intended for use in installations. "Nonet" (1979) which starts off this disk, was realized at Stanford University's computer music studio, and is a small jewel of early computer music. What I like most about this work is its timbre, or maybe a better description might be its "feel". The combination of the steady-state electronic tones with the slightly sour 18 tone equal tempered tuning, the multilayered dynamics, and the now slow, now skitteringly fast melodies, create a sensuous sound world that I just want to "sit in" for a long time. "Soft Walls" (1980) was one of the first pieces Cary made on the Synclavier I he installed at the late electronic music studio at the University of Adelaide. This is a piece in which steady tones, raspy FM tones, and gliding or wobbling tones all mix and coalesce. Changes in intonation in this piece are also very sweet. Glissandi of harmonic series arpeggios alternate with very "out of tune" sounding sound complexes. Intonation is here used as a means of creating harmonic and timbral contrast. The piece moves between several timbral worlds, giving glimpses into each of them before turning to another. This is another of the pieces that I feel implied a larger set of potential musical events that were just represented by this one realization. "Sine City II" is a 1996 remake of materials from 1979. It's a piece made up of many sine waves, producing a kind of steady state piece which, because the sine waves are sometimes gliding, and always coming in and out at different rates, creates a smoothly evolving world of gently changing beats and shimmering dissonant harmonies. I found this piece especially rewarding on headphones. The changes in the apparent physical mass of the sound, as tones appeared and disappeared in each ear, was sensuous in the extreme. "Black, White and Rose" (1991) is a piece for Marimba, Gongs, Woodblocks and Tape. The tape is mostly made from transformed samples of the original percussion instruments. This is a piece about contrasts and juxtapositions. Often the original sounds, with attacks, are modified so they are steady state sounds (a latter-day use of reverb to create clouds of sound from an initial short sound) with non-percussive elements. And there is an interesting harmonic contrast as well. Tape and instrument alternate which plays diatonic material while the other plays pentatonic material. That is, one plays the "white keys" while the other plays the "black keys". The use of diatonic material here is rendered all the sweeter by being mixed at times with noise-based textures, so that when the diatonic moments occur, they provide moments of harmonic "breathing space", rather than simply being presented as the whole musical story. It's a very rich piece, and presents a bit of an epic musical journey. Each moment can be sparse of even soloistic, but as the piece progresses, and you remember bits of it, you realize the enormous range of musical material you've experienced. "Three Clockpieces" (1983/96) are shorter excerpts from a longer work composed in 1983. They are delicious polyrhythmic miniatures, with somethimes as many as 12 simultaneous tempi occurring. Three byte sized bits that left me wanting lots more. For these pieces, Cary wrote a program that allowed him graphic control over certain of the parameters of a piece. This program was used more extensively in "Trellises" (1984), his final work on the Synclavier system. "Trellises" is another infinite piece, which uses similar timbres to those developed by Cary for "Soft Walls". This 12 minute excerpt from a potentiially infinite piece only explores part of the territory that the program could visit. There are many attractive moments. I was especially taken by a section around 7:20, which featured descending chromatic scales. The kind of structure of this piece and pieces of its kind from this period - a non-directional wandering around a few rooms of a potentially vast world - was a prototype for the structure of the world wide web. So do the kinds of structures artists use in their work leak out to become structures that are then accepted as normal by the rest of the world. The computer CD finishes up with a series of excerpts from the 1994 "The Impossible Piano (Homage to CN)" for sequencer and sampled piano. The confluence of the computer sequencer, the sampler, and Conlon Nancarrow's work was a stimulus for many composers in the late 80s and early 90s. (Note to postgraduate students no.2: A thesis exploring the many pieces written for computer controlled piano sounds in this period.) Cary's pieces are delightful polyrhythmic pieces, using melodic and rhythmic material derived from manipulations of the letters of Conlon Nancarrow's name. Much of the melodic material is diatonic, and the result are pieces which while diatonic, are not "tonal", but have a very wistful sound. I recall a brief conversation with Cary during this period, where he said that he had come up with a different way of handling C major. These pieces are the result of that, and they do indeed provide a different way of looking at one of the oldest (at least 4000 years) of musical scale formations. Of the individual movements, I found "Counterpoint 6", with its 8 short sections starting and stopping, and "Power Bounces 4", with its chords which degenerate into separate rates of "bouncing" for each of the component notes, to be especially attracting in both overall sound and form. This two CD set is valuable not only for its historical merit, but also for the wonderful music it contains. To travel through 41 years of electroacoustic music with Tristram Cary, one of the pioneers of the genre, hearing the products of his eager, exploratory mind, and his sense of musical charm, is a great privilege, and one I recommend.